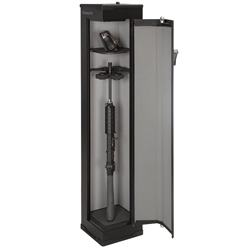 The best gun safes offer secure storage space for your firearms. Keeping your guns in a location only trusted members of the household can get to should be one of the top priorities for every responsible gun owner. Whenever you purchase a new firearm you should also look for a way to store and secure it. Storing your firearm in a gun safe will prevent it from being misused by young household members, and it will also prevent it from being stolen in a burglary. Gun safes might seem expensive at a first glance, but once you realize their role is to protect your most expensive firearms and other valuables such as jewelry or important documents, their price is justified. In the following article, you will find the top-rated gun safe reviews and reveal their pros and cons! But these are relatively smaller safes, if you are searching for a bigger one, scroll down to see our fav gun safes under 1000$ list! This safe has a unique fingerprint pad for easier access. It will hold up to thirty prints. The safe can be mounted with the mounting hardware that is included. If you can’t unlock the vault with your print, you can use one of the two backup keys that are included. You should clean the scanner as much as possible for better results. The safe is shipped with pre-drilled mounting holes so you can secure it to a hard surface. This safe has a one-year limited warranty. It will hold up to thirty fingerprints. You should program your print from different angles, so it opens every time without error. Has more room than other models. 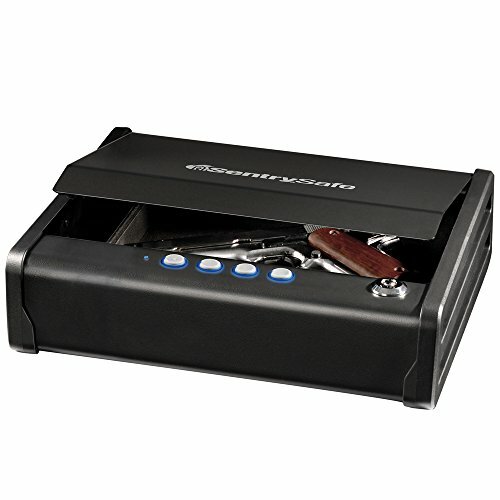 You can store two handguns, ammunition, extra magazines, and significant documents without the safe being too crowded. The scanner is picky. You won’t get any false opening by people that you have not programmed their fingerprints into the safe. The key has a unique shape to prevent anyone from picking the lock. It takes a few seconds for you to release since the fingerprint feature takes a few seconds to read your print. The delay would not be noticed. Beeps when it opens or closes. There are instructions in the manual that tell you how to put the safe in silent mode. Not fireproof/waterproof. I would recommend that you do not store important documents inside the safe. It is not equipped with an interior light. You can access it in the dark, but you can’t see the contents. 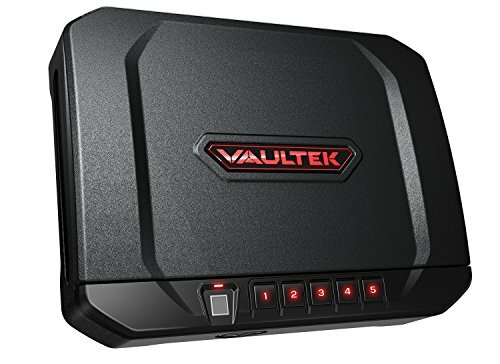 The Vaultek VT20i is made out of 16 Ga steel and it comes with a powder coat finish that prevents corrosion. This model uses a smart safe technology that allows you to interact with it through your smartphone. One of the things we liked about this model is that it offers multiple quick-access options. You can get into to the safe using its keypad, the keyed entry, or its Bluetooth option. Moreover, the safe comes with a high-resolution biometric scanner that can store up to 20 fingerprints for easier access. With so many means of access, it’s safe to say you will be able to get to your weapon quickly at all times. The safe barely makes any noise when you open it, and it has interior illumniation that will allow you to grab your handguns with ease at night. The safe can hold up to two pistols and some additional ammunition. This model comes with everything you might need to use it, including mounting screws, a security cable, battery, charger, and even a screwdriver for the installation. Multiple Access Options – So there’s no chance to be locked outside. Rechargeable Battery – It has a lifespan of 2.5 hours. 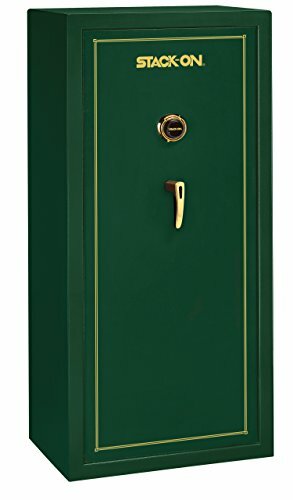 This safe has a 5 mm thick steel door and 20 mm motorized deadbolts. The door can be unlocked in less than a second if you use your finger, or less than 5 seconds if you choose to open it using the 4- to 9-digit pin code. The interior of the safe is fully carpeted and has an integrated LED light. The black powder coating will protect the safe’s surface from accidental scratches and rust. The interior also has a fully adjustable shelf which is also removable if you need to keep larger valuables secure. 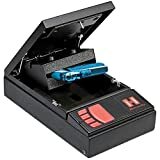 Reliable Finger Scanner – The finger scanner is very reliable, it will read registered fingerprints even if your finger is dirty or wet. The scanner will memorize up to 32 different fingerprints but will not open to unauthorized ones. Fully Carpeted – This safe’s interior is fully carpeted, so you don’t have to get a liner mat to protect your guns from scratches. No Display Light – The safe’s display does not have a backlight, so you wouldn’t be able to use it properly at night unless you turn on the light in the room. Hidden Key Hole – The security keyhole is placed under the label, so you have to unscrew the label to reach it. This may be inconvenient in the case of an emergency. 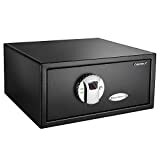 This safe is made out of 14 gauge steel and can be mounted horizontally or vertically. Because it’s a mechanical safe, you don’t need to worry about battery life or electrical wires. This model is not a large one, it will only fit a single full-framed handgun but you don’t even need a larger vault if you’re looking for a safe way to store your home defense weapon. The Simplex lock needs a 4 digit pin to unlock. You can select the 4 digit combination out of 8 digits. You can’t use the same digit twice, but once you’ve selected the pin it won’t open unless you press the digits in the right order. You don’t have to reset the pin if you punch it in the wrong order, you can just restart the operation. Mechanical – you’ll be able to use it at all times without electricity or batteries. Good Instructions Manual – Being a mechanical system without an electric memory, the pin combination has to be changed by rearranging the pins on the keypad. This might seem like a difficult process, but the clear instructions will help you do it in under 5 minutes. Limited Portability – Has a carrying handle, but the 14 gauge steel is not really lightweight, so it has a limited portability. This model uses a 3D imaging system to capture very detailed fingerprints images. This is the kind of technology used by government departments that need fingerprint identification. The safe has an automatic lock security feature that will lock the door without your involvement when the door is closed. This security feature guarantees that if the door is closed, it’s locked as well so nobody else can get hold of your weapons. The safe’s Advanced User Management will allow you to view and modify the users who are allowed in the safe, assign different privileges to different users, and view the log to see who used the safe at certain moments. Large Fingerprint Memory – Will be able to memorize up to 40 different fingerprints, so different people will be able to use it at the same time. Easy Set Up – This smart vault is a breeze even if you are not a technology driven person. Front Tag Covers The Key Hole – The manufacturer’s front tag covers the emergency keyhole, and a really small Phillips head screwdriver is needed to remove the tag. This can take a while to accomplish, so you should avoid running out of batteries. This is a pistol safe equipped with a push-button combination lock. The buttons are backlit which facilitates unlocking in the dark. Unlike many other combination locks, this one doesn’t require batteries. Before entering your combination, you are required to press a button to activate the keypad but it is still much quicker to access than a vault with a traditional lock. It is on the small side, but it has plenty of rooms. This model will house a handgun and extra magazines, plus it has a one-year limited warranty. It may be a solid option as a safe for your car as well. This vault does not require batteries like most models of this kind. Most vaults’ locking mechanism can be seen inside the vault when you open the door. You can’t see the mechanism on this one so a thief can’t pop the lock with a paperclip or other object. Many other models have a reset button that are the easiest to get to and can be reset by anyone. The reset button on this safe is hidden behind the batteries, so it has to be opened in order for it to be reset. It does not beep when you press the buttons when it is in silent mode. You have to press a button to activate the keypad before you can enter your entry code. You can’t find a way around this, but it does not slow down the access time much. You can still open the safe in a matter of seconds. It is very possible for you to not entirely hit a key that will make you enter the wrong combination. Make sure you firmly press each key to preventing yourself from entering the wrong entry code. If you do not hit each key firmly and enter the wrong entry code, you will have to wait a few seconds for the safe to reset. Reacts a little slower than other models do when entering the entry code. Press the keys a little slower than you would on some other models to prevent entering the wrong code. This may be the best handgun safe with a digital keypad for the ones who need easy access. It has a drop-down drawer making it ready to fire when you draw. This one is like a pistol holster with a lock. It can’t get better than that, right? 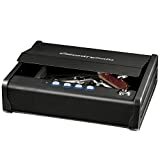 This is one of the perfect safes for mounting in a vehicle within arm’s reach as you travel or run errands. There is a five-year exclusive warranty on this safe for fire and burglary. Designed so you can mount it nearly anywhere including in a vehicle. It is equipped with internal lighting so you can see inside the safe. It has a silent mode so the keypad won’t make any noise while you enter the entry code. Feels solid when mounted, unlike others that feel flimsy. Makes a small noise when the latch locks/unlocks. This can’t be silenced, but it can’t be heard by an intruder in another room. The white internal light might be too bright for some people’s comfort. The low battery warning only works when you touch the keypad. Keep fresh batteries nearby at all times in the event the batteries go dead while you are away. The keypad is a little picky. Practice entering your code if you want to get in quicker. 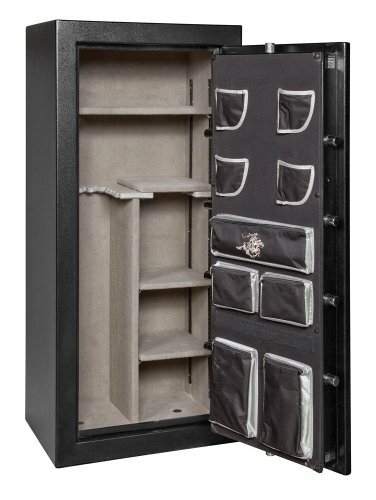 This Fort Knox handgun vault will protect your pistol or valuables whether in your car or your house. It has 1081 user combinations. The hinges are spring assisted so it opens quicker. The safe looks secure enough when bolted to a solid surface that a thief usually won’t take the time to steal it since it will be much trouble to gain entry. Unlike many other brands that have a warranty for a few years, this one comes with a lifetime warranty. Does not use batteries so you can get to your handgun at all times. Will hold two pistols and extra magazines. The hinges are made of heavy gauge steel so the door can’t be busted off like most safes. The installation instructions are more confusing than other safes instructions. There are videos that break down the instructions so that you can understand it better. These videos can be found on YouTube. Can’t be unlocked in the dark unless you are very familiar with the layout. I recommend that you practice opening the safe. Does not come with a backup key option. If you forget the entry code, you have to reset it. Resetting the code can be a little difficult to figure out. Call the company or watch a video to learn how to reset the entry code step-by-step. This safe has a touch-free entry, but it has a child-resistant design. It is a quick entry safe that keeps your firearms secure but ready to use at all times. You have multiple access means with this Hornady safe. It opens with an RFID bracelet that is fairly new technology in the weapon vault industry. The safe opens much quicker than some of the other safes without the delay. You can register your safe on the website and receive a lifetime warranty. Can be opened with the RFID bracelet, RFID card, or key fob that are included. It comes with three RFID bracelets. It is much easier to program than other models. The security cable is much heavier than the ones that come with other models. A thief wouldn’t attempt to waste his time cutting through the cable to steal the safe. Opens with your gun holstered for a quicker draw, so you are ready to fire within seconds. The lid is louder than some other models when it opens. There is nothing you can do about this. The sound isn’t loud enough for an intruder to hear if they aren’t in the room with you. It opens slower than you would expect from a quick access vault. You could help the lid up with your hand to speed up the process. The wristband isn’t sensitive enough. Try all the methods of unlocking to see which one works best for you. People have mentioned that it does hang at times when opening. The delay is only a few seconds. You could try helping the lid up with your hand to keep it from hanging. This Stealth model is a high-quality model that can hold up to 5 pistols, 3 of which in easy-to-grab positions. The safe comes with a pistol hanger that will keep 3 handguns in an upright position, making them easy to grab when you’re in a rush. The other two handguns can sit on their sides on the safe’s bottom. We really liked this safe’s well-thought design. The interior light is red, but it’s bright enough to highlight your guns, so you can spot each individual handgun easily, even the ones on the bottom. However, it’s not so bright as to be seen by someone else, even if that person is in the same room. You can unlock the safe by entering a 6-digit security code. The code is a piece of cake to set up and change when necessary. The first button of the keypad has a built-in dimple, making it easier to unlock the safe in low-light conditions. The interior foam lining is of great quality, and it will protect your handguns against scratches and accidental damage. 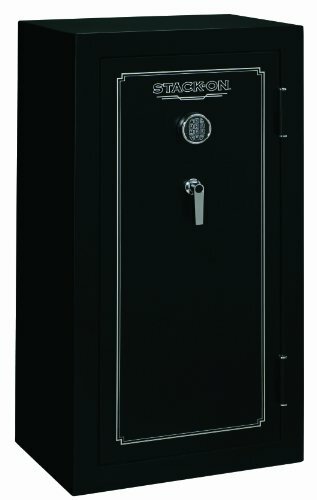 This safe is has a 10 Ga steel construction. This heavy-duty model comes with an anti-pry clamshell design, making it very secure against forced entries. One of the things we liked about this model is that it has a no-nonsense construction. The safe is built like a tank. Despite its relatively small size, this is a heavy weapon vault. This vault weighs around 22 lbs when it’s empty, and it comes with 4 quarter-inch holes on the bottom you can use as anchorage points. The lid covers the hinge pin, so burglars won’t be able to take the hinge pin apart to open the safe. As far as the safe’s security is concerned, you will need to program a 5 bottom combination to release the lid. The push bottoms will make a low clicking noise when you press them, so the vault can’t be operated silently. This vault is loud enough to accommodate two handguns and ammo, or a handgun and some valuables. Heavy-Duty – Has a heavy-duty build that makes it very sturdy. Due to popular demand, we’ve compiled the table below with our top-rated picks up around the $1000 mark. As we’re moving up in dollar range here our expectations are also rising. The following models all come with some awesome features, and so they should because you’re paying for it! This high quality vault from Stack-On can house up to 22 firearms which are up to 54 inches in length. 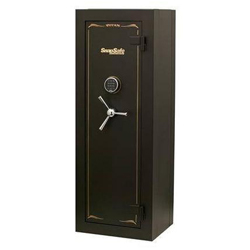 The safe features a 3 number drill resistant combination lock which works on a two-way locking mechanism featuring three 1 inch locking bolts and two deadbolts. 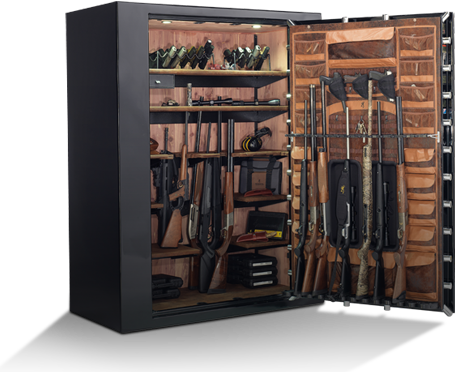 The safe contains internally adjustable shelves and features a limited three-year warranty. 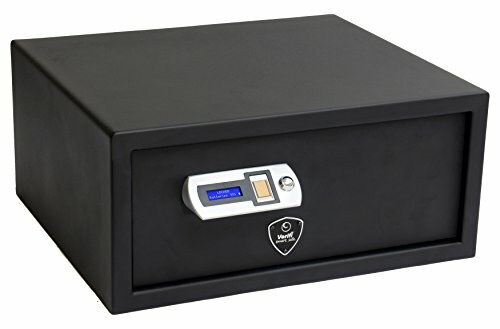 Stack-On has been known to make high-quality gun safes and this product is a fine example of that, with it having received only positive feedback. The paint job could have been a little better, but in terms of requirements, the safe can withstand anything and is sure to keep firearms secure. Click here to see more Stack-On models. This premium steel body gun safe from the Mesa Safe Company is tested to be resistant to fire for one hour up to 1750F. The model features a digital lock which works with a spring loader which re-locks the device when punch activated. The safe can house up to 14 rifles and carries a limited lifetime warranty. This firearm vault is relatively new to be introduced to the market and it is already receiving raves. Negative comments on this model are difficult to come by. This fire resistant safe is indeed touted to be one of the top gun vaults under 1000 dollars. This high-grade gun safe from Sentry features a programmable electronic lock with manual override keys which work on large 1-inch bolts. The capacity of this model is 2.1 cubic feet. The product features a one-year limited warranty. The only gripe with this gun safe is that the manual can be a little confusing and some customers might require additional guidance. Otherwise, for the cost at which it is featured, you cannot really go wrong with this high-quality gun safe from Sentry. The Ranger gun safe from Winchester is a high-quality safe which can contain up to 24 shotguns or single barreled rifles with an interior space of 11 cubic feet. This model is also fire resistant and features a four-way locking system with 10 steel locking bolts of 1.25 inches diameter. The product features a limited lifetime warranty and also a free replacement guarantee. This new safe in the market is already drawing a lot of attention. It proves to be a satisfactory product overall, satisfying most people’s criteria and proves to be worth the money as well. View more Winchester models in our brand-specific review page. 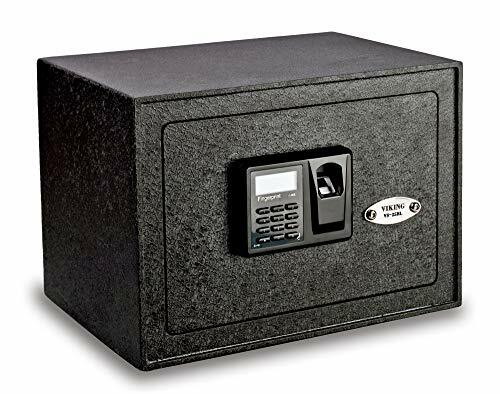 The Stack-On E-40 is a highly rugged and durable fireproof safe which features an electronic lock which works on a four-way locking action with a 1.5 inch live locking bolts. 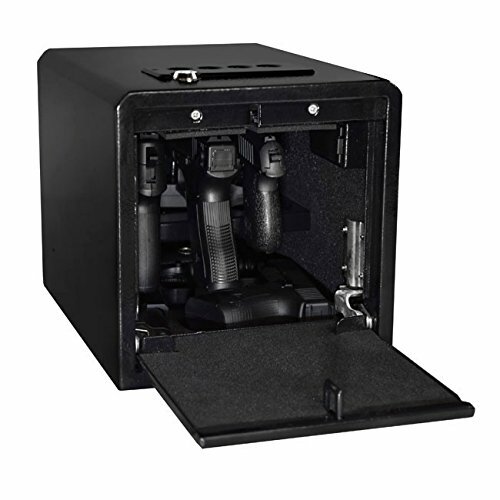 The safe features three adjustable shelves and can house up to 30 small pistols or handguns. The product carries a limited lifetime guarantee and a limited five-year warranty. Stack-On is a reputed brand and this is reflected in the quality of this safe. The build and durability is A-plus. 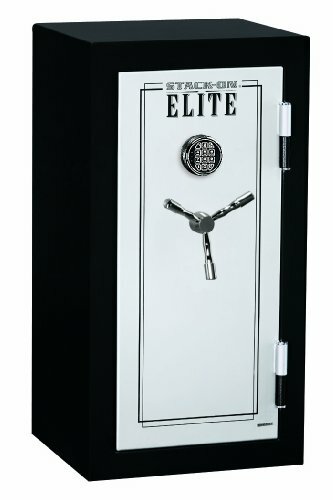 Most customers have been impressed with the durability and build of the safe. This fireproof model is highly recommended. 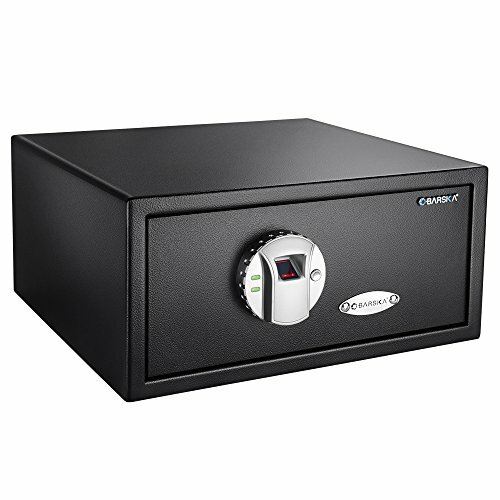 Hit up out our list of the best fireproof gun safes to compare features and costs. This high quality and rugged safe from Stack-On is fireproof and can house up to 24 guns. The safe contains four internal shelves and is accompanied with a lifetime warranty. The safe features a two-way locking system with 2 deadbolts and 5 points for locking. 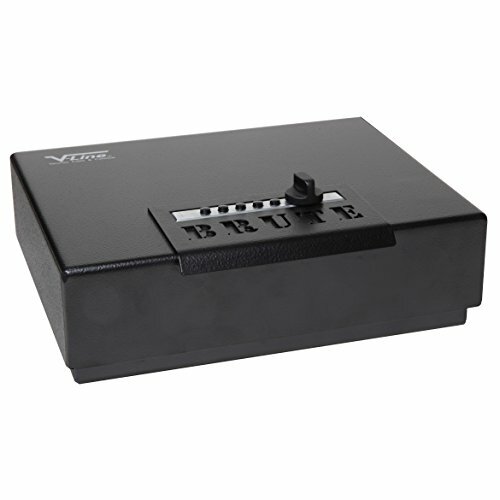 The safe can be opened by an electronic key and also a backup manual key. This model from Stack-On has been touted by many to be a great entry model safe and as such, it has been receiving quite a lot of popularity. Customers are usually very happy with the features and no complaints have been found about any aspects of this high-quality weapon vault. This premium grade gun modular safe from SnapSafe is fire-resistant for one hour at temperatures up to 2300F. The safe can hold over 12 rifles or shotguns and features an electronic lock with 8 three-four inch chrome steel locking bolts. The product carries a one-year warranty and also contains adjustable interior shelves. This product is extremely popular with most past customers score it very high. Setting up of the safe may take a little time but once done, this safe works wonderfully well. There are many reasons for a gun owner to own a gun safe, no more so than if you are a gun owner and parent. I have compiled a list of reasons you should own a gun. You should take all these ideas into consideration. The government is trying to take Americans guns away from us. If you keep your weapons locked away, it can help protect your 2nd Amendment rights. As an American, you have the right to bear arms. If you are a gun owner and you have children, many states have a law in place that you have to have your gun locked in a safe away from children. This will keep your children from getting the gun and hurting themselves or someone else. Some states have a law in place that you have to keep your gun locked away when it is not in use even if you don’t have children in your place. California has a law that you have to have your gun locked away by a firearms safety device that is considered safe by the California Department of Justice. When you purchase a safe, you should see if it has this approval. Many gun owners own more guns than insurance will cover. Many insurance companies only cover $3,000 worth of guns. Are your weapons worth more? If so, you should invest in a secure vault to make sure your guns are safe from fire, water, and thieves. Many insurance companies will give you a discount if you own a gun safe. If you already own one, or you purchase one, you should see if your insurance company is one that offers a discount for this. A safe can secure your guns and possibly save you money. Do people know you own guns? You might not know that many burglaries are carried out by people they know. If a person you know breaks into your house, steals your gun, and murders someone you could be charged with a crime you didn’t commit or the victim’s family could sue you. I know you don’t want this to happen. There are hundreds of gun safes that will protect your guns in the event your home goes up in flames. When buying a safe, you should see if it will save your firearm or any other valuables from fire damage. You might be the type of person that has a gun in your place for protection. A gun locked in a safe can still offer you protection. There are quick access gun safes on the market. With one of these babies, you can still retrieve your gun in a few seconds but when it isn’t needed it will be protected. Some people buy a gun safe without knowing what they should be looking for, and some people do not know that there are features you should look for in a gun safe. Below is a list of features you should look for and why you need these features in the safe. This will help you select the right model for you. You should purchase a vault you think is too big for your guns. You might acquire more guns and need more space to lock them inside in the future. If you get a specific model that is only big enough for the guns, you currently have and buy more in the future you will also have to get a bigger safe. A gun safe that is fire resistant cost more than a safe that isn’t but you should pay the extra money for the protection. A fire can destroy your guns, and you will be out of more money than the additional protection would have cost you. All gun safes are not secure enough if an intruder wants to get to the contents. Some safes are made of steel that can be easily split or drilled through. You should look at the specifications of a safe. You should not purchase a safe that is lower than 10-gauge steel. I recommend you purchase a safe made of 8-gauge steel since it is nearly impossible to penetrate. Mother Nature can destroy your guns too. When looking for a safe you should buy one that will not allow water inside. Your weapons will be destroyed if water gets into it and the extra money will prevent this from happening. The type of lock that you prefer depends on what you will be using the safe for. If you are going to be using the safe for protection, you should purchase something that you can unlock quickly. 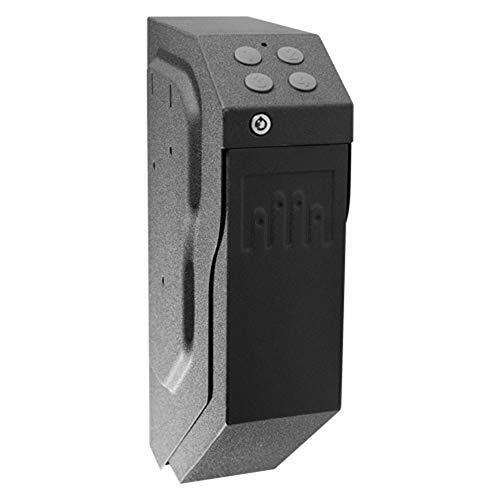 Usually, quick access ones are electronic and have a keypad lock or some kind of biometric scanner. If you are using your gun safe to protect your guns and you don’t need them for protection, a safe with a key lock or combination will do the job. Just because you have a safe doesn’t mean your guns or valuables are secure. A burglar can easily walk away with a lightweight vault and break into it later. You should consider a safe that has holes for you to anchor it to the floor or any other solid object that can’t be easily moved. If the safe doesn’t have pre-drilled holes, you should ask the manufacturer if it is okay for you to modify the safe so you can anchor it down. It could void the warranty if you amend the safe so always ask the manufacturer before modifying a product. Some models on the market have alarms. You should see if the one you are interested in has an alarm in the event someone tries to pop the safe while you are home. This is a useful feature if you have curious children that might try to gain access to the safe to see what is so important you have to lock it away. A safe with a keypad can be opened by a burglar that tries hard enough. When buying a safe with a keypad, you should get one that will lock when someone keys the wrong passcode multiple times. This will prevent them from trying until they enter the correct pin. Electronic systems take batteries. There is nothing worse than having than a safe that has dead ones. Make sure that, if you decide to purchase one, the safe has a backup entry option whether it be a key or A/C adapter. Many safes can be drilled into with hand tools. To prevent this, you should see if the safe is BF rated or a higher, which would mean it is nearly impossible to access unless you give someone permission. How To Keep Your Combination Confidential? Keeping the combination to your safe confidential is critical. You cannot trust many people nowadays including family. Never write the combination on a piece of paper unless you are sure that nobody will get a hold of the document. If someone stumbles across the paper and he or she knows it is the combination to your safe they will get tempted to enter the safe to see what is so important that it needs to be locked inside. Kids! They are also curious and smarter than we give them credit for at times. They might remember the passcode if they see it entered enough. Even some small kids have decent enough memory to remember the PIN. If your child knows the location of the safe and recognizes the entry code, they can pop the safe when you are not looking in a matter of seconds. What if you have a loaded gun stored inside? Your child can get their hands on it, and that could turn into a disaster. You trust your friends, right? Well, never trust them enough to unlock the safe in their presence. If they see a pistol in the vault or other valuables, they might be tempted to enter your house when they think you are away and steal what is locked inside. An adult can remember the passcode by seeing it opened once. Put the entry code on a device that has a lock or somewhere nobody will find such as your phone. If you have the code in a locked phone the possibilities of someone getting, it is nearly impossible. When you are looking for a safe that fits your lifestyle, you have two choices when it comes to the kind of lock that better suits you. They both have benefits that you will like, and they also have downsides like everything else. An electronic lock usually has a keypad to enter a passcode or a biometric reader. A mechanical lock can only be opened with a key. Most electronic safes come with a mechanical locking system also for backup if your battery happens to go dead and you need to enter the safe. Most people purchase a safe with both kinds of locks since the electronic locks are quicker to release than mechanical. If you decide to purchase a safe with an electronic lock, you should always remember that most of them run off of batteries. Some come with an A/C adapter if you can plug it into an outlet but if not, you have to keep fresh batteries in it at all times. A mechanical lock is okay since you do not have to worry about anything going dead when you need to access the safe, but they take longer to unlock. When you are looking into purchasing a safe, you should consider the manufacturer of the safe also. Below is a list of well-known manufacturers and their expertise. This can help you decide which manufacturer makes the safe that better fits your needs. ioSafe: This company is a significant manufacturer of digital safes. They manufacture disaster-proof hardware which makes it amazing when they put that feature in a safe. Sentry Safe: Sentry Safe is one of the biggest manufacturers in the world. They are the main manufacturers of fireproof gun safes. They have an extensive list of UL rated safes. 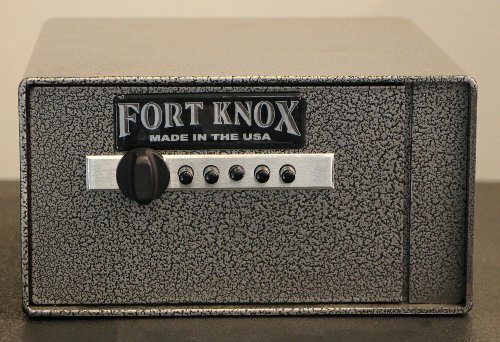 Fort Knox: Fort Knox has been a well-known manufacturer of gun safes for many years because they allow you to create the safe that meets all your needs. You don’t have to purchase a pre-designed safe when you go with a Fort Knox safe. I hope you found the best handgun safe that fits your lifestyle whether you were looking for the best bedside gun safe, the best pistol safe, or just looking at the top-rated gun safes. The safes in this list go from low-end to high-end so there’s one that will fit your budget. They also differ in features so you can find one that fits your lifestyle. A weapon vault is the best investment you can make as a gun owner. Gun safe ratings are critical when you are searching for something to keep your guns from thieves, fire, water, or just curious people. There’s a gun safe for you no matter the reason. You should always weigh out the pros and cons before making a final decision since the safe could mean the difference between life and death if you are using it for protection. We hope you find our gun safe reviews useful! My brother kids are starting to get older, and they come over every Sunday for dinner. I think its time I put my guns up into a safe. I don’t want my nieces or nephews to get a hold of any of my weapons. I think it is important to teach gun safety to children, but they should not have easy access to the guns themselves. I am going to look into something that will fit into my walk in closet nicely. As much as I like guns, I do not like to expose my children and wife to my gun. I came across your article when I was searching. I particularly admire the Gunvault SpeedVault SV500 gun safe. 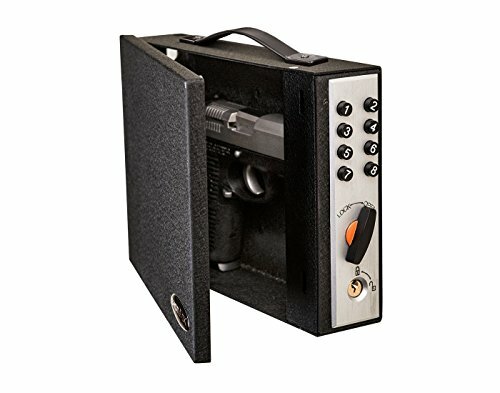 I would really like to be able to choose the right kind of safe for my gun. I do not know much about gun, let alone gun vaults. I am glad each one of these has the full description of what to look for. Wow! All these gun safe are amazing. I might visit here some time to check if it has any updates. I’m looking forward to viewing your posts. Waiting for next articles. Thumbs up! Great reviews and information right here! Thanks for sending me in the right direction. Thanks, I appreciate your efforts. You enlist the good ones which keep children out from the guns. As you know kids how curious they are. SO having a good gun safe is must have thing if you love guns. Are the RFID ones pretty consistent opening? Do you know the time in which it would open? I haven’t heard of this kind of technology in the gun safe world. Thanks for the informative post. nice article and like the way you publish it. thank you for the post and keep up the good work.